The Budapest Summer Festival offers a wide range of cultural programs for the summer months beginning on 09. June at 20.00 with a free jubilee concert celebrating the 80th birthday of the festival. Then on 15. June, the National Philharmonic Orchestra will perform Carl Orff’s Carmina Burana to officialy launch the 3-month event. The Great Gatsby Ballet performance (06, 07. July), by star soloists of the Saint Petersburg Mariinszkij Ballet, as well as dancers from the Complexions Contemporary Ballet (USA) and the Kiev and Odessa National Ballet companies. Planets concert by Jeff Mills and the The Danubia Orchestra of Óbuda on 13. July. going up a lookout tower and reveling in the wonderful vista. Note: Some programs, concerts may have ticket prices different from the prices listed below. TIP: You’ll get 30 % discount on ticket prices with a Budapest Card. 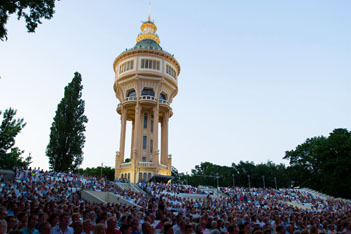 The 3000-seat open-air stage is at the recently renovated Water Tower (Víztorony) on Margaret Island. 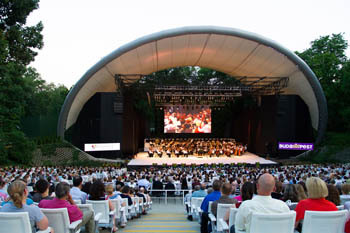 The theater has been hosting classical opera and ballet pieces, as well as rock operas and musicals in recent years. 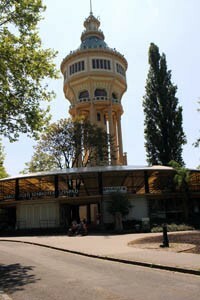 The Városmajor Open-Air Theater is located in a lovely park in Buda. It can seat 1000 people. Musicals, prose, performances for children will be staged from June till end of August 2017. Performances start at 20.00 except the Danube Carnival programs between 03 – 08. June. Children programs start at 10.30 each Sunday. Szent István Park, Port 1. Price of the boat transfer: 1 500 HUF (return trip is incl. ), you can buy a one-way ticket to get back from Margaret Island: it costs 800 HUF. Where to Buy Boat Tickets? You can also buy boat tickets online at www.mahart.info. From May you can also buy tickets at the festival venue, the Open-Air Theatre on Margaret Island. Boats return back after 20 minutes of the end of each performance. Tickets: FREE program (registration is required) – recommended for all ages. A special opening event to celebrate the 80th birthday of the festival. The venue, the sprawling green meadow of Margaret Island is fitting for the occassion since more people of all ages can enjoy the free program. The Hungarian State Opera House Orchestra and the special guest star Alexander Rybak – violin virtuoso, singer and Eurovision Song Contest-winner – guarantee an amazing festive evening. Following the tradition of previous years the gala performance of the National Philharmonic Orchestra kicks off the 3-month cultural festival. Strauss’ tragic drama will be presented in German with Hungarian subtitles. Libretto written by Richard Strauss, based on the play by Oscar Wilde. Based on the story of F. Scott Fitzgerald and the Oscar-awarded movie from 2013 the dance show highlights the vibrant and debauch world of America in the 1920s America. Star soloists of the Saint Petersburg Mariinszkij Ballet, as well as dancers from the Complexions Contemporary Ballet (USA) and the Kiev and Odessa National Ballet companies. The innovative DJ known for grandiose compositions comes to Budapest with his latest concert: Planets – a sci-fi work inspired by the nine planets of the solar system and the self-knowledge gained from contemplating the univers and space. The sensual performer of passionate emotions, the popular star singer of the opera world, Erwin Schrott, comes to Margaret Island with a unique and exciting gala evening. The popular music genre will be back on stage after a decade with Imre Kálmán’s popular work, the Circus Princess. The spectacular show provides a glimpse into the dazzling world of the circus against the backdrop of aristocratic life. A co-production between the Margaret Island Open-Air Theatre and the National Theatre of Miskolc. Virtuózok (Virtuosi) is the world’s first classical music talent show of the young generation that run on the Hungarian channel, M1 in autumn 2014. The show and the performers became very popular and have been invited to perform many times since the end of the show. On 20th August, which is a National Holiday in Hungary commemorating the foundation of the Hungarian State and the country’s first king, St. Stephen, the 9 finalists will give a festive performance. A live broadcast of the fireworks show on the banks of the Danube crowns the event. The refurbished 106-year old Water Tower reopened in May 2012. It is a look-out tower as well as regularly hosts exhibitions. The floodlighted tower provides an ideal background for the Jazzy Tower concerts on warm summer nights. Concert tickets: 3 800 HUF that includes a return boat ticket, look-out tower and exhibition ticket, concert entry, welcome drink. Folk performances by the Duna Folk Ensemble and other folk groups between 03. and 08. June. The children’s stage is opposite the entrance of the Open-Air Theater on Margaret Island, surrounded by three sycamore trees. children stories welcome the youngest ones as well as grown-ups who are open to playful entertainment. Each performance is cc. 40-50 minute followed by interactive plays, craft workshops, song and dance learning. Tickets: children performances are FREE. Performances start at 10.30 Saturdays from 11. June till 28. August. The open-air theatre in Városmajor, Buda also has performances (puppet show, theatre) for kids every Sunday starting at 10.30. 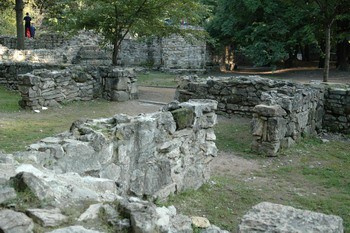 The Renaissance mornings at the ruins of the St. Margaret Monastery are free to enjoy every Sunday from 10.30 from 12. June till 14. August. Recommended for children aged 7+. TIP1: You can enjoy short music performances at various venues in the city in summer, including Margaret Island (Musical Fountain), the Basilica, Gerbeaud Cafe, Várkert Bazaar and more. TIP 2: The Vajdahunyad Castle hosts concert evenings from 02. July to 16. August 2018, on Mondays and Thursdays; a great program for warm summer evenings.